Naturally perfect wood protection. With Sansin Enviro Stains, you can have the best of both worlds. Modified natural oils and resins are carried deep into the wood’s cell structure using one of nature’s commonplace miracles – water. As the water evaporates, Sansin bonds directly with the wood substrate, forming a tough, durable barrier that won’t crack, peel or blister. When you need a tough, non-yellowing finish that offers glass-like beauty and clarity, choose Purity Glacier. Perfect for high-wear surfaces like cabinetry, shelves, doors, furniture and even floors, Glacier is available in both clear and solid formulas. Purity Glacier provides a lacquer finish that meets and exceeds all KCMA benchmarks, defining the beauty of your wood and adding character and dimension. Available in a wide variety of striking colours, Purity Interior Stain is designed to penetrate deep into wood for lasting color and exceptional beauty. Specially formulated for brush or spray application, Purity Interior Stain will transform your home interior with defined grain and rich, even color. SANSIN SDF provides tough, effective protection for wood siding. SDF’s specially formulated oils and resins penetrate into the wood, providing outstanding weather and UV protection in a wide range of natural, semi-transparent and even solid colours. Thanks to SDF’s unique water-borne technology, it can provide complete protection in just one coat – although a second coat will provide an even more beautiful and richer finish. 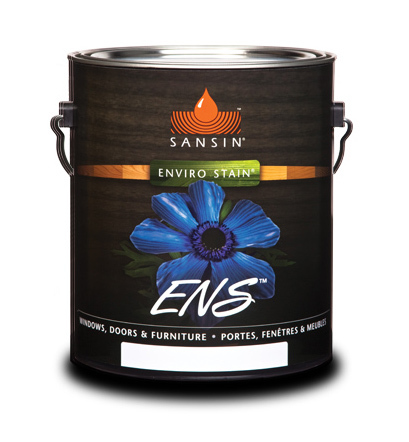 SANSIN ENS is a durable two-coat finish that can be applied to virtually any surface – from millwork, to siding, to decks and even to improve the performance of other coatings. That’s because ENS is self-priming and offers exceptional adhesion to almost any surface, resulting in a satin or gloss finish of exceptional beauty.